Villa Leopoldain the French Riviera topped the list of the Top 10 Luxury Houses in the World for the third consecutive year, according to the latest ranking issued by President Magazine, World Real Estate Academy and World Entrepreneur Group. The United Kingdom is home to the highest number of Top 10 Luxury Houses with four spots on the list. There are less than 2000 known people in the whole world who would be able to purchase these houses. Ho Tung Garden in Hong Kong is the only Chinese luxury house on the list. The list is based on the Luxury Estate Index, which was developed by the ranking's compilers. The report states that the Luxury Estate Index is comprised of six indicators: location, natural amenities, architectural design, human value, construction materials and safety and privacy. 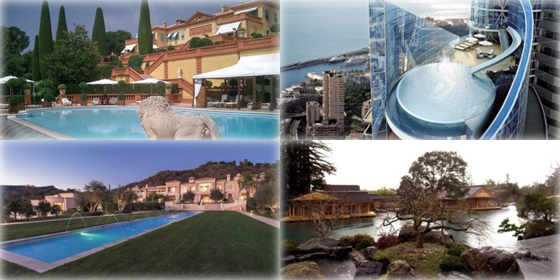 Let's take a look at the top 10 luxury houses in the World. Villa Leopolda topped the latest list of the Top 10 Luxury Houses in the World by President Magazine, World Real Estate Academy and World Entrepreneur Group.